We think of small talk as a way to pass the time or kill an awkward silence but a group of evolutionary psychologists are suggesting that these idle conversations could be a social-bonding tool passed down through evolution - well, in their press release they write "passed down from primates", which shows why you should be wary of psychologists discussing science. The authors say that because social primates may use vocalizations more selectively than scientists thought. Instead, they found that ringtailed lemurs (Lemur catta) living in groups primarily call and respond to the individuals with which they have close relationships. While grooming is a common social-bonding experience for lemurs and other primates, the researchers found that lemurs reserved vocal exchanges for the animals that they groomed most frequently. Lemurs vocalize to essentially "groom-at-a-distance" and keep in touch when the group members they're closest with get separated such as when foraging for food, said first author Ipek Kulahci, Ph.D. in ecology and evolutionary biology from Princeton. "Our results indicate that when animals respond to each other's vocalizations, they are in fact also working on maintaining their social bonds," said Kulahci. "By exchanging vocalizations, the animals are reinforcing their social bonds even when they are away from each other. This social selectivity in vocalizations is almost equivalent to how we humans keep in regular touch with our close friends and families, but not with everyone we know." The findings could have implications for how scientists understand the evolution of primate vocalizations and human speech. Some existing hypotheses of language evolution suggest that vocal exchanges between primates evolved with group size, he said. As group size increased, grooming to form social bonds became too time consuming, so speech developed to save time while still expressing familiarity. The authors contend that vocalizations occurred independently of group size. The lemurs the researchers studied groomed more as their numbers increased, but did not necessarily vocalize more. These findings show a direct connection between grooming -- or familiarity -- and vocalization not found before. Talking, even casually, is an evolutionary tool for establishing closeness, they believe. 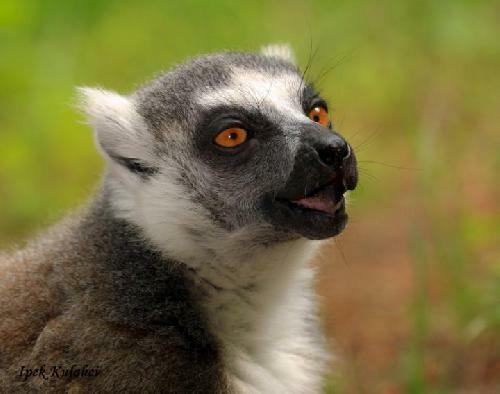 The researchers studied the vocal interactions and grooming networks of various groups of ringtailed lemurs living at Duke University's Lemur Center and on St. Catherines Island in Georgia. They found that grooming itself was selective and performed only between certain individuals. Vocalizations went even further in selectivity -- the animals responded only to the calls of those they groomed most often. The lemurs' use of grooming and vocalization to establish greater levels of familiarity could help scientists understand how forms of communication are interrelated, they say. Like lemurs, humans interact using various verbal and physical actions that are complementary and contextual.